Last year I got $552 in Credit Card Rewards for a 1.55% return. This year we got a total of $686 in rewards between our American Express Costco Tru Earnings card and a Citibank Dividend card. We use the Amex card for most of our purchases but use the Citi as a backup when people don't take Amex. We also used the Citi for restaurant purchases for a few months when Citi card was offering 5% rebate at restaurants. We also had $170 from our Citibank card. That was from about $8524 in spending for a 1.99% return. Most of the Citibank bill was actually a large medical bill that was later reimbursed out of our HSA. In total we had $686.12 in rewards from $43,697 spending for 1.57% return. We put all of our spending on credit cards that we can to maximize the cash back rewards. We never pay interest on the cards and always pay the balance off in full each month. Currently the IRS allows you to deduct sales tax as an itemized deduction from your taxes in place of a state income tax deduction. Previously you only had the option of deducting state income tax. However now if you itemize you can choose to deduct either the sales tax or the state income tax. You can not deduct both sales tax and state income tax and you have to choose one or the other. You can only claim the state sales tax deduction if you itemize your taxes. If your standard deduction is higher than the total of itemized deductions then you'll pay lower taxes by taking the standard deduction. You always want to figure it both ways and pick the higher deduction between the standard deduction or itemized deductions. Should you deduct sales tax or state income tax? Since you have the choice of sales tax or state income tax you should pick the deduction which is higher. For many (if not most) states the state income tax paid by individuals is usually higher than the total sales tax paid. However there are many exceptions where the sales tax paid is more. If you made a major purchase during the year then you have have an exceptionally large sales tax bill for that year. Did you buy a new car? Purchase a boat? etc. You'll have to look at your own state income tax bills and your sales taxes to determine which is higher in general for you in your situation. There are two ways you can figure your sales tax deduction. 1) you can use the IRS estimator or 2) you can save all your receipts and add up all the sales tax you paid on them. 1) The IRS sales tax estimator is available online at the IRS website. The IRS estimator is a simple calculator that will make generic guess on how much sales tax you pay based on your income and ZIP code. You simply tell the calculator your income, # of exemptions and what ZIP you live in. You can also tell it the tax paid on specific items including cars, boats, aircraft or mobile homes assuming you pay general sales tax rates on those purchases. This makes it easy if you know you have a major purchase like a car but didn't keep all the rest of your receipts. 2) To add your receipts manually you first need to save all your receipts through the whole year. Then you need to go through every single receipt and add up all the sales taxes paid. This method maybe time consuming and tedious but it might well be worth the effort. Is it worth your time to manually add up the taxes? This decision may be too late to make now for your 2010 taxes since if you weren't saving your receipts for all of 2010 then you missed that opportunity. However now is a good time to look ahead to 2011 or future years to decide if saving receipts is worth it. Saving all your receipts and adding them all up may be a hassle and could take a lot of time. Problem is that you won't know for sure if its worth your time to add them all up unless you add them all up. Catch-22 isn't it? However you could guess if its going to be worth the effort by using the IRS estimator to see what it would say and then making your own estimate of what you actually pay in sales taxes. To do this you'll have to have a grasp of your sending. If you use budgeting software or track your budget then you can just add up all the taxable columns from last year and get a rough estimate of total spending. Remember to not count the budget columns that aren't taxed by general sales tax. For example in my budget I add up all the columns that you'd pay general sales tax on and I come up with something around $20,000 to $30,000. Then if my sales tax rate is 9% (for example sake) then that would mean my general sales tax last year was roughly 9% of $20,000-$30,000 or $1,800 to $2,700. If my income is $100,000 and I plug that into the IRS estimator then it estimates that I'd be paying about $1,500 in taxes. So I could add up all the receipts myself and claim $1,800 to $2,700 or just use the IRS estimator and claim $1,500 with no extra work. Therefore the extra work of tracking and adding my receipts would man an extra $300 to $1,200 deduction. If my federal marginal tax bracket is 25% then that would equate to $75 to $300 in tax savings for my efforts. Saving all my receipts and manually adding the total sales taxes would probably net me $75 to $300. Now I think spending a couple hours counting receipts is well worth the time and effort to save $75 or more. Whether or not manually saving and adding your sales taxes is worth it depends on your individual spending. Saving receipts is not too hard, you just shove them in your purse or wallet as you make purchases. Then on a regular basis like once a week you can dump all your receipts into a box or something to keep them all in one place. Adding up the receipts is more time consuming, you have to look at each receipt and add the total. But even if you've got 500+ receipts in a year then that still shouldn't take longer than a few hours time. I would use a spreadsheet like Excel to add up the numbers. If you use a simple calculator then eventually you'll goof up and lose track and have to start over. If you use Excel then all the numbers are in the spreadsheet and you don't have to start over but just fix individual errors. If you want, it might make more sense to add up your receipts on a monthly basis. That way you aren't having to face 2+ hours of effort at tax time but break it up into more manageable and less mind numbing 15-20 minute chunks once a month. Once you know your sales tax total and have decided that its the right deduction to take then claiming it is pretty straight forward. In order to deduct your sales tax from your federal income taxes you have to itemize your deductions. Itemizing requires filling out schedule A for your taxes. You simply check the 5b box for general sales taxes and then write the total sales taxes paid (or the estimated value) into the line 5. 1.) This is a preliminary step based on rough estimated numbers. Determine if itemizing deductions is worth more than standard deduction. If you know for sure that your standard deduction will be higher than itemized deductions then stop and don't bother trying to deduct sales taxes. If you think you can itemize more deductions than the standard deduction then proceed to step 2. 2.) This is another preliminary step to see if deducting sales taxes is a good idea. Compare your state income taxes with your general sales taxes. If your state income taxes are definitely higher than your general sales taxes then stop and claim the state income taxes instead. However if you think your sales taxes are generally higher than your state income taxes then proceed to step 3. 3.) Decide if you want to use the IRS calculator or add your sales taxes manually. If you want to add them manually then you need to save all your receipts for the year and add up the totals. 4.) Once you've got the total sales tax rate then compare it again to your state income taxes and verify the sales tax is higher. If sales tax do end up higher then add up your itemized deductions. If itemized deductions are higher than the standard deduction then claim itemize your taxes and claim the sales taxes on line 5. Bottom Line: For some people out there the ability to deduct sales taxes instead of state income taxes on the itemized deductions could be a good tax saver. DoughRoller answers What is IRS Tax Form 6252? Yahoo carried this article : Separate but unequal: Charts show growing rich-poor gap which as it says has several charts showing the income inequality. I like charts. In this case the gap between perception and reality is interesting to see visually. There seems to be a lot of people out there who think that the inflation index is something between inaccurate to outright propaganda. Two common beliefs about the inflation index are discussed here. Myth #1 : The government doesn't count food or gasoline in the inflation numbers. "Increases in indexes for energy commodities and for food accounted for over two thirds of the all items increase. The indexes for gasoline and fuel oil both increased in January, continuing their recent strong upward trend. The index for food at home posted its largest increase in over two years with all six major grocery store food group indexes rising." Its pretty obvious that the CPI inflation measure includes gasoline and food. Some people may be confused because there is an alternate measure that excludes gasoline and food but it is clearly labeled as such as "All items less food and energy". The primary inflation figure cited is the core CPI that does include food & gasoline. Myth #2 : When the price of steak goes up the government assumes we buy ground beef instead so they just switch the more expensive steak for hamburger or chicken or tree bark. False. The government does not substitute between items in different CPI categories. They only assume that substitution occurs between items in the same category. Hamburger and steak are not similar enough to be in the same category. They might however assume that we would substitute rib eye for filet mignon or flank steak as those are in the steak category. Furthermore they don't automatically assume you substitute downwards to lesser goods. Sometimes they assume you will substitute upwards for example if flank steak goes up enough in price then some people will move up to more expensive filet mignon. Myth #3 : I spent 8% more on health insurance, my cable TV went up 12%, tooth floss doubled, and Levis jeans are $5 more this year than last year but the government said inflation was just 3.5% so the government is lying about inflation. False. The CPI is an average measure of inflation across all consumer goods. Your individual experiences and spending behavior will not match the national average perfectly. e.g. If gasoline goes up then this will impact taxi drivers significantly more than people who don't own cars. You can read more about the Common Misconceptions about the Consumer Price Index: Questions and Answers at the BLS.gov site. Yahoo carried the Forbes article Careers Headed for the Trash Pile The full Forbes article is here. 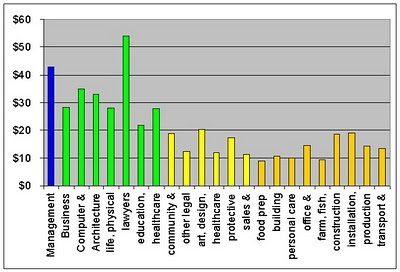 It lists professions which are on the decline. I think 'trash pile' is a little exaggerated as most of these are not about to disappear entirely. 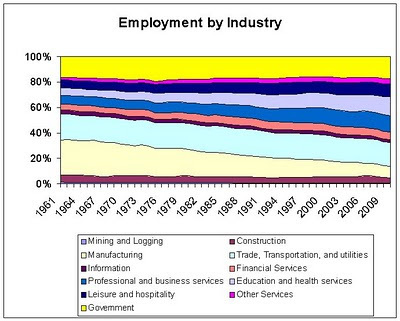 But these occupations do have decreasing employment numbers and lower demand. Many of these are outdated things and the decline in employment is expected. Seamstresses, Radio Operators and Photo processors are generally obsolete fields. I'm was initially actually surprised that computer operator and office assistant are declining. But it actually makes sense. Computer technologies are always getting more centralized, efficient and easier to manage thus requiring fewer operators. Business efficiencies from technology and cut backs would lead to fewer admins. I haven't had admin. support at my job for years. I question if Carpenter is really a dying profession. I think they may be confusing the drop in employment from the recession and subsequent decline in new home construction with a decline in the profession. Bottom Line: If you're in one of these fields now or considering entering one then you should be aware that the job may have a limited future demand. How Many Jobs Actually Require College? It seems that everyone thinks you need to go to college nowadays. The job market doesn't really require that everyone get a degree however. Exactly how many jobs in America actually require college degrees? To make it easy I decided to lump jobs together into general occupational groups. I got the data out of the BLS Occupational Employment and Wages report from May 2009. That data is a little dated but the general trends really haven't changed a whole lot since then. Note: I'm grouping jobs into general categories based on larger occupational groups. This is all just approximate. There are undoubtedly various exceptions to the groups I've defined. These are the jobs that traditionally require a college degree. You generally don't become an engineer, accountant or nurse without a college degree. There are exceptions to the rule but the general expectation is that people in these careers will need a 4 year degree or more to get employment in the field. These jobs are in careers that might need a degree but often don't. It may depend on the employer or the local regulations in some cases. You may be able to succeed in these fields without a degree and a degree may not be a requirement at all. Most general service level jobs and blue collar jobs do not require college degrees. There are some exceptions but in general the expectation that college isn't required for these fields. 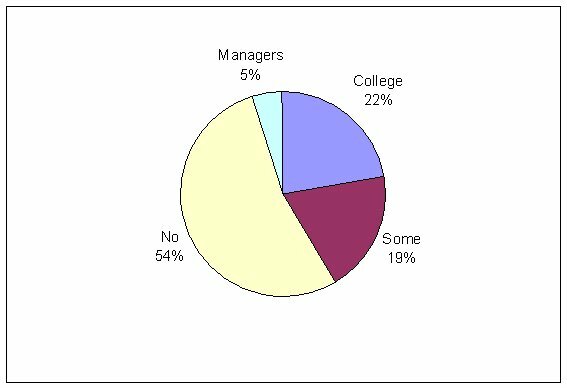 Management positions often require degrees, but there are also many managers who have worked their way up the corporate ladder and have no degree. It will depend on the employer and the field. There are 6.1 million management jobs and the median hourly wage is $42.95. Bottom Line: Most jobs don't require college. Jobs that require college fetch higher wages. This article from MarketWatch via Yahoo: Risky Business: Jobs You Never Knew Were So Dangerous discusses jobs that have high injury rates which might surprise you. Theres a few things to take away from the article. The rate of fatal occupational injuries for farmers and ranchers is 38.5 per 100,000 full-time workers, versus 4.4 for fire fighters, and 13.1 for police and sheriff's patrol officers, according to U.S. Labor Department data for 2009, the most recent available. I don't know about you but it seems that many people think that firefighters and police are the most dangerous jobs in the world. They aren't. Have you ever watched Dangerous Catch? Fisherman is the most dangerous job in the country. Fisherman consistently have the highest fatality rate. Police are often in the top 10 but sometimes they aren't. Firefighters usually don't break the top ten. We all know that police and firefighting is dangerous work. When a police officer or firefighter dies in the line of duty it is often all over the evening news. Fatalities in other jobs do not get so much media attention but that doesn't mean they don't happen. If you look past the fatality rate you get another picture. Sure policeman might be a more fatal job than many but they may not be as likely to be injured or ill on the job than some other occupations. Bus drivers are injured quite frequently. They say : "Bus drivers are exposed to a lot of force and vibrations when they are driving," I believe this. Whenever I take a long road trip of 6 hours or more at the end of the trip I'm pretty tired out. It is surprising how much driving a long distance can stress your body. Driving a big bus can be more jolting on your body due to how those huge vehicles move. Nurses can have more frequent injuries too. They explain "Being stuck by a needle can be a problem..." and I assume they may be exposed to illness more as well. Dental hygienists can also have more injuries about which they say "a lot of complaints from dental hygienists, who may assume contorted positions as they work hard on plaque-covered teeth." I can understand that tree trimmers would get injured. They work on ladders and risk falling. EMTs and drivers are also jobs I can see having more frequent injuries. The more you drive the more you can get into a car accident. I can also see how house keepers could be injured more often that some jobs because its not an easy job and has a lot of bending and such. But the other jobs on that list really don't seem like they are very hazardous. Why would dietitians and nutritionists have high illness or injury rates? Is there some hazard about the food pyramid that I'm not aware of? Maybe there is a reason those occupations would have higher injury and illness rates that I just don't know of. But I doubt it. Notice that most of these jobs are in government positions. What I suspect is that these people are not really sick or injured. I believe what we are seeing here a list of government workers who play hookie from work due to very generous sick leave policies at government jobs. More power to them. But if you ask me these statistics are skewed by the amount of sick leave and policies for taking sick leave. Bottom Line: Some jobs are obviously dangerous, some jobs are dangerous but its not as obvious, and statistics may be lying. This Yahoo article One Year To a New Career gives a list of seven jobs they say you can get into within one year. Its a pretty good list of jobs over all. I look at this list as a short list of decent jobs you might transition into. I think this is most valuable for someone who is currently unemployed or in a dying field. These are fairly good jobs you can get into fairly quickly. The wages for these jobs are generally in the $25,000 to $40,000 range. You can make a living with these occupations. However they tend to cite the average wages for the jobs. The average wage for a job will be more than you should expect to make when you first start out. The article claims that you can get into each of the jobs within a year. The exact time it takes will depend on local training options and possibly state requirements. It might take a two year program to get into many of these fields. Medical, dental and pharmacy assistants all have good job prospects. There is increasing demand and there isn't an over supply of people looking to get into the jobs. Administrative assistants and chef jobs are about average as far as demand and competition. Paralegals and graphic design are good jobs but I think theres a fair amount of people wanting to get into those fields. You'll likely to be competing with people who have 4 year college degrees. There is keen competition for graphic design jobs. If you're considering training for a career like one of the seven listed then you should definitely look at the local public community college first. Don't go to some for profit college that advertises non stop on TV or radio. The for profit schools will likely charge you $20,000 a year for training you can get at the community college for more like $3,500. Most of the for profit colleges are total rip offs in my honest opinion. Personally I like the pharmacy assistant option but thats more my personal preference. But its one that may or may not take longer than one year depending on how they do it in your area. The wages according to BLS average about $13-$14 an hour. Nothing fabulous. But I think it would be a good work environment and a stable job with good future. Also in my area you can get into the field in less than a year with a quick certificate program via the local community college. Of course that may not be true in your area. Dental assistant is also a good field. There is always going to be demand and they get paid fairly well. I don't think Chef is a good bet. Competition for the better chef jobs at good restaurants is keen. Maybe I'm wrong but what I've heard is people who train as chefs usually end up as cooks more often. Cooks make more like $10-$12 an hour. Graphic designer is one I'd avoid due to the high competition. Theres way too many people trying to get into that field for you to have a safe bet at landing a decent paying job. Of course if being a chef or graphic design are really your passion in life then maybe its worth doing one of them. One thing that sticks out is the gradual downward trend in the manufacturing jobs as a % of the whole. If we look at the percent of total jobs that each industry has you can see that there were some major shifts in the 50 year period. You may often hear something in the press like "the average new house is now 2,400 sq. ft". This might lead us to believe that a 'typical' or 'average' house is 2,400 sq ft. right? Well no. The key word there is "new house". New houses are larger than old houses. The median house size in the USA is currently 1,800 sq. ft. 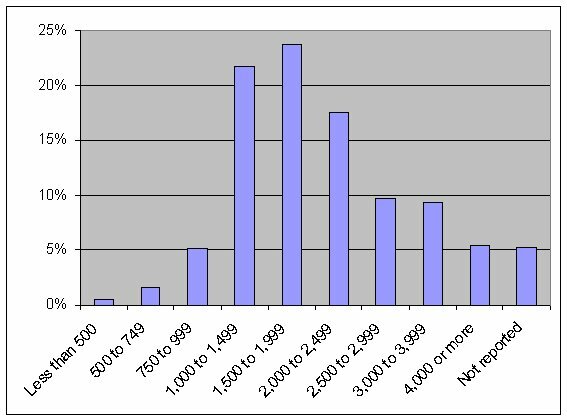 Since that is the median, that means that half the houses out there are less than 1800 and half are more than 1800. Thats a lot less than 2,400. The census has data on houses. The American Housing Survey for 2009 has all sorts of data on housing in the US. I looked specifically at table 3-3 'size of unit and lot' to get the data below on current home sizes. 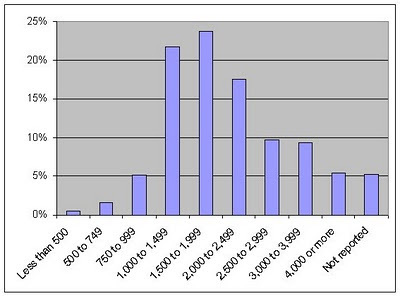 Note that the far right item covers 5.3% of home sizes that were 'not reported'. 45% of homes are between 1,000 and 1,999 sq. ft.
41% of homes are between 1,500 and 2,499 sq. ft.
63% of homes are between 1,000 and 2,499 sq. ft.
72% of homes are between 1,000 and 2,999 sq. ft.
7.3% of homes are less than 1,000 sq. ft.
14.8% of homes are over 3,000 sq. ft. I'm only looking at owner occupied homes. So this does not include rental properties. Currently our house falls roughly in the middle at about 1,400 sq. ft. We're looking into getting a bigger home eventually. Last month I wrote that Americans do NOT spend 6 billion hours on their taxes I explained how I think the claim that we spend 6 billion hours on taxes is, well ridiculous. We'll call this article part 2 in the series. "Olson, the national taxpayer advocate who runs an independent unit within the IRS, estimates the cost of preparing returns and coping with tax laws at $163 billion in 2008—11 percent of income tax receipts." I'm sorry but am I the only one that thinks this kind of claim is totally ridiculous? This Olson lady sure likes to make up ridiculously big and unbelievable numbers. Next she'll be telling us that shipping all our jobs to China is saving us $18 trillion a year or that NAFTA has raised our GDP 200% or that Matthew Mcconaughey won 1 Oscar. The $163 billion figure is another example of a Numerical Fiction. To illustrate why I think that number is not even close to reality lets look at this a few ways. 1. $525 per person. There are roughly 310 million people in the USA. $163 billion would work out to about $525 per person. So if we spent $163 billion then every man woman and child in the nation spends $525 a year on average to handle their taxes. Whats Turbo Tax cost like $30 or $50? 2. $1,147 per tax form. In 2008 there were a total of 142 million tax returns filed. If we spent $163 billion a year total then that would work out to $1,147 average per tax filer. Wow, that would hire a lot of CPA time. 3. All the accountants in the nation. There are 1.1 million accountants and auditors in the country. They make mean wages of about $67k a year. Total wages for all the accountants would be about $73.7 billion. Many accountants do various other things. 4. If H&R Block did all our taxes. H&R block does the taxes for 1 in 7 Americans. H&R Block's total annual revenue is around $4 billion. If H&R Block did the taxes for all Americans then the cost would be about $28 billion and we'd be paying too much. Compare those two options to the $163 billion claim. We could pay every accountant in the nation to do nothing but taxes and then pay H&R Block to check their work twice and still not spend $163 billion. It doesn't add up. Bottom Line: We don't spend $163 billion preparing our taxes. I read Budgeting in the Fun Stuff written by Crystal, (good blog check it out). She recently wrote an article Please Comment on this Bad Experience with a Vacation Rental. Crystal is talking about a bad experience that Sandy from First Gen American had with a vacation rental home. [edit : removed references to dead links] Sandy had rented a property on VBRO and had to cancel due to bad weather. The owner of the property refused to refund her money. The rental contract apparently doesn't allow for refunds, but Sandy thinks she was scammed. I read all about Sandy and her unfortunate $1200 loss. At first it seemed like a rip off. But then I thought that it really depends on the policy. I wouldn't expect a refund from Hotwire since their hotel reservations are explicitly nonrefundable. But if I got a standard reservation with a Holiday Inn Express directly and they wouldn't refund me then I'd be quite upset. It all depends on the system and what the normal expectations are. That all brought me to wonder: What IS the cancellation and refund policy for vacation rentals on VBRO? I dug around the help section on VBRO to find out what their policy was. Getting a straight answer on this was a lot harder than I expected. First of all it was harder than I thought to even get a detailed answer to "what is VBRO?" or "what does VBRO do?" They have a button/tab at the top of their page named "Rental Guarantee". I click on that figuring that it will explain what VBRO's guarantee is. But its just a link to buy vacation insurance. No real help there. The "About VBRO" link should tell me more. There isn't too much there either. At least they have a basic description of what VBRO is: "We provide an online space for homeowners to advertise their vacation properties and make it easy for travelers to search 150,000+ rentals in over 100 countries worldwide." Note: You may want to consider the HomeAway HomeAway Carefree Guarantee, as well as a signed lease agreement with the owner/manager. See "Protecting yourself while renting "by-owner" http://www.vrbo.com/global/protect_yourself.htm for more details. OK. I then visit that last link to see what they recommend for "Protecting yourself while renting"
That page is mostly about how you should protect yourself from fraud on their site from property owners who misrepresent themselves or are outright scammers. 7. Prior to sending any money to an owner or providing a credit card number, ALWAYS request and receive a completed rental agreement or contract. Be sure it specifies the dates you will be staying in the property, the cost of the rental, any deposits, taxes, cleaning fees, and the cancellation and refund policies. Without a signed rental agreement DO NOT consider the rental to be yours. If you do and something unforeseen happens, you may have little recourse in getting your funds returned. If an owner prefers not to use a contract or written agreement, find one that will. Ok, now thats more on target. I then follow that link on cancellation and refund policies. ...you will usually need to make a full or partial payment upfront in order to hold the property. Normally this is not a problem, BUT if you have to cancel your trip (especially at the last minute), you should know that you may forfeit a portion or all of your rental fees. There are ways to protect yourself however - FIRST: Make sure you know what the cancellation policies are for the property you are renting. SECOND: Consider purchasing Trip Cancellation Insurance for added protection. If you have to cancel your vacation rental trip, are you eligible for a refund? It depends on the cancellation/refund policy of the property that you are renting and how much notice you are able to give. Question: What is the refund and cancellation policy at VBRO? Its really your responsibility as a renter to make sure you get a rental agreement from the property owner and then read it before you give them your money. VBRO is very much like eBay in the kind of service they provide. VBRO is a medium for people to advertise their stuff. Like eBay, VBRO does not have any real direct control over the property owners. Bottom Line: If you're renting on VBRO then you need to be extra careful that you understand all the policies and get everything in writing and keep an eye out for scammers. Don't expect VBRO to act like a big hotel company or a travel agent, they're more like the classified ads. Dough Roller tells us What is IRS Tax Form 709? fivecentnickel answers the question Are Scholarships Taxable? The Simple Dollar answers the question Does Home Photo Printing Really Save Money? U.S. News ran an article 10 Major Mortgage Mistakes to Avoid via Yahoo. For details on each item please read the full U.S.News article. I agree 100% with that list. I've mentioned before that my wife and I have been looking for houses. Some of the items listed will be on our to-do list before we actually make an offer. Other items we've avoided and will continue to avoid. I've got items #1-5 covered already. I watch my credit on a regular basis by getting my credit reports via AnnualCreditReport.com so we're covered on #1. We'll avoid moving assets around, job hunting or applying for other credit before we apply for the mortgage so that handles #2,4,5. I have been adding in taxes & insurance when estimating our potential payments so that addresses #3. Items 6-10 we haven't done yet but plan to do. Our next step will to get pre-approved for a mortgage. We haven't done that one yet since we've been just casually shopping so far. The above-listed stock is part of a non-mandatory reorganization or tender offer, which currently expires on 12/16/2010. For offers initiated by the company, information can often be found on the company's Web site. If the offer was initiated by a third party, additional information can be obtained by contacting your local branch office. If you decide to participate in this offer, you will need to inform your local Scottrade branch office no later than 10 a.m. ET on the expiration date listed above, and a $25 fee will be charged to your account. These shares must then remain in your account until the reorg/tender takes place. Please note that the expiration date for such actions is often extended and terms of the offer are subject to change. Scottrade is not endorsing or recommending the offer, and the terms have not been reviewed to determine if accepting the offer would be in your best interest. If you do not wish to participate in this offer, notification is not required and Scottrade will take no action on your behalf." "FAIRFIELD, Conn.--(BUSINESS WIRE)--General Electric Company (NYSE: GE) has been notified of an unsolicited “mini-tender” offer by TRC Capital Corporation to purchase up to 5 million shares, or approximately 0.05%, of the outstanding GE common stock at a price of $15.15 per share. TRC’s offer price represents approximately a 4.5% discount to the $15.86 closing price of GE common stock on November 16, 2010, the day before the offer commenced. In addition, TRC’s offer is subject to numerous conditions, including the availability of financing on terms satisfactory to TRC. ..."
Okayy.. so this company TRC Capital was trying to buy GE stock at 4.5% BELOW the market value. I see no reason I'd want to do that. Why would a company make such an offer? Huh. Smells like a scam to me. "Investors need to scrutinize mini-tender offers carefully. Some bidders make mini-tender offers at below-market prices, hoping that they will catch investors off guard if the investors do not compare the offer price to the current market price. Others make mini-tender offers at a premium – betting that the market price will rise before the offer closes and then extending the offer until it does or improperly canceling if it doesn't"
I wondered if people could use this kind of thing as some sort of hedge just in case a stock goes down below its market value. I could potentially lock in a price 5% below market today if I assume that the stock will drop even further in the upcoming month. Theres no reason you can't do that on your own with a limit order so this mini-tender has no extra value. But even if you wanted to hedge then it won't work with the mini-tender. According to Wikipedia page on mini-tender offers "If the market price of the stock falls below the mini-tender price before the offer closes, the bidder can cancel the offer or reduce the offer price." The Wiki page also notes that TRC is a company that does a lot of mini-tender offers. In the Adobe offer TRC was also trying to buy shares for 4.5% below market value. They also targeted Raytheon, Monsanto, Yamana Gold, HP and others. In ease case I find a mini-tender from TRC Capital the company in question that is the target of the offer comes out to recommend against accepting the offers. There is really nothing good or beneficial in these mini-tender offers for the owner of the stock. I took GE's advice to reject TRC Capital's offer and I hope everyone else did so also. More on mini-tender offers from Motley Fool : "Mini-Tenders, Big Headaches"
There is apparently nothing illegal with these offers. It seems TRC Capital is just exploiting the SEC rules about mini-tender offers in a ploy to cash in on unwary or naive investors. I consider it a scam in the sense that they are basically just exploiting people. Its technically legal to offer someone $95 for a $100 bill, but if the owner of the $100 bill isn't smart enough to know that is a rip off and their ignorance is what you're banking on then that is a pretty slimy way to make a living. Bottom Line: If you own stock in a company that gets a mini-tender offer from TRC Capital then you should NOT accept the offer. How Much Do 401k Fees Cost? Higher fees on your retirement investments can erode your returns. Its certainly best to look for lower fee options. Unfortunately you do not have any choice when you are using a employer 401k and you are stuck with the fees they have. One big problem I have with 401k's is how hard it is to find out what the actual fees are. What are the Average Fees? This report from Deloitte : Defined Contribution / 401(k) Fee Study has some data on fees from 2009. They came up with what they call the 'all in' fee which measures the total fee expenses for a 401k. As 401ks handle their fees differently they had to normalize it to do a useful comparison. The nature of the particular 401k plan will impact the fees. Larger plans with more assets will have lower fees figured as a percentage. Its more efficient and cheaper to administer a 401k for 50,000 people than for 12 people. A small plan with 10 participants and average funds of $10,000 may have fees approaching 2% whereas a large fund with 50,000 people and $150,000 balances may pay 0.2%. What are YOUR 401k Fees? The website BrightScope has a lot of information on many 401k employer plans. They rate plans based on "total plan cost" how they compare to other plans. So your plan may be rated 'lowest fees' if the fees are low which is the case for Google's 401k. The BrightScope site may have the Form 5500 online. This form has financial details of the fund. For example see the Trader Joe's 5500 On page 2 they list total assets of $471 million. On page 4 they show the expenses including $253k in administrator fees. Thats a pretty low fee rate for the amount of assets. It works out to about 0.05%. If your 401k isn't on Brightscope then you can find out the fees for your 401k by digging into the plan documents. Your 401k should have a Summary Plan Description (SPD) and a Form 5500 which describe the details of the plan. The SPD may tell you who pays the fees. For my own 401k at work my employer actually pays the administration fees. If these forms are not available on your 401k site then you can request them from your employer. Another site with data on average auto insurance rates by state is the Auto Insurance Rate Report from Homeinsurance.com. Their data is a more recent but they don't have figures for every state.